Sales of new single-family houses in July 2016 were at a seasonally adjusted annual rate of 654,000. This is 12.4 percent above the revised June rate (582,000). It’s also 31.3 percent above the July 2016 estimate (498,000). The percentage of existing homeowners who view the U.S. real estate market favorably jumped to 66 percent. Millennials are the most optimistic, with 76 percent of millennial respondents viewing housing favorably. The biggest challenge for Gen-Xers who are searching for a home is saving money for the purchase, according to the survey. Completed foreclosures were down 4.9 percent year-over-year. Home prices were up 5.7 percent year-over-year. 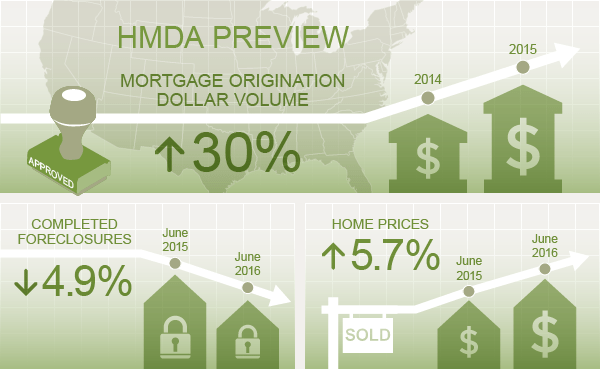 The company estimates that dollar volume for mortgage origination increased 30 percent from 2014 to 2015. The total U.S. loan delinquency rate (loans 30 or more days past due, but not in foreclosure) was 4.51 percent in July 2016. This is 4.78 percent higher than June 2016. However, it’s 3.38 percent lower than July 2015. According to First American’s model, the market for existing-home sales is underperforming its potential by 1.3 percent or an estimated 92,000 seasonally adjusted, annualized rate (SAAR) of sales. This is an improvement over last month’s revised under-performance gap of 1.8 percent, or 104,000 (SAAR) sales. This month, potential existing-home sales increased to 5.71 million (SAAR).